The Vermont Workers' Center has been working with people to organize and improve conditions in their workplaces since 1998. 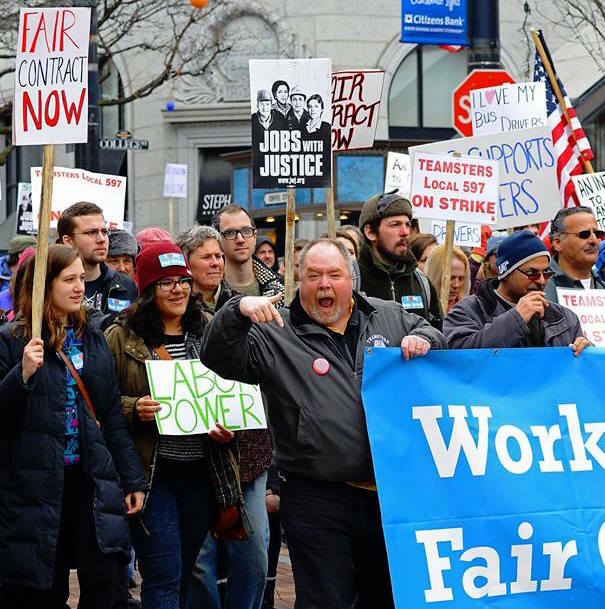 Over the years, we've learned that the best way for working people to improve workplace conditions is to form unions and bargain a contract with their employer, and to demand that elected officials change laws which disproportionately benefit wealthy Vermont residents. While full-time employment was the standard of work for so many in our parents’ generation, today the entire economy is being restructured towards increasingly contingent and precarious work, with grave consequences for working families. Combined with steady cuts to our social safety net, more and more people in our communities are finding themselves thrown into debt and poverty and unable to afford basic human needs like food, housing, and healthcare. Organizing to build power in our communities and workplaces changes that equation. From the victorious Burlington bus drivers’ strike in 2014, to the wave of victories for the Fight for $15 movement, to the recent success of the Verizon workers, we’ve seen that when workers and community members unite in solidarity, we can change the balance of power and win rights and dignity in our workplaces. Join us! Support people fighting for their right to work with dignity through forming unions and bargaining contracts with their employer. Interested in learning more? Contact kate@workerscenter.org to get involved.